Absorbed dose is a measure of the energy deposited in an irradiated medium by ionizing radiation per unit mass. Absorbed dose is used in the calculation of dose uptake in living tissue in both radiation protection (reduction of harmful effects), and radiology (potential beneficial effects for example in cancer treatment). It is also used to directly compare the effect of radiation on inanimate matter. The SI unit of measure is the gray (Gy), which is defined as one Joule of energy absorbed per kilogram of matter. The older, non-SI CGS unit rad, is sometimes also used, predominantly in the USA. The quantity absorbed dose is of importance in radiation protection for calculating radiation dose. However, absorbed dose is a physical quantity and used unmodified is not an adequate indicator of the likely health effects in humans. For stochastic radiation risk, defined as the probability of cancer induction and genetic effects occurring over a long time scale, consideration must be given to the type of radiation and the sensitivity of the irradiated tissues, which requires the use of modifying factors. To represent stochastic risk the quantities equivalent dose H T and effective dose E are used, and appropriate dose factors and coefficients are used to calculate these from the absorbed dose. Equivalent and effective dose quantities are expressed in units of the sievert or rem which implies that biological effects have been taken into account. The derivation of stochastic risk is in accordance with the recommendations of the International Committee on Radiation Protection (ICRP) and International Commission on Radiation Units and Measurements (ICRU). 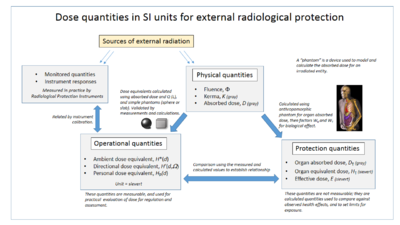 The coherent system of radiological protection quantities developed by them is shown in the accompanying diagram. Conventionally, in radiation protection, unmodified absorbed dose is only used for indicating the immediate health effects due to high levels of acute dose. These are tissue effects, such as in acute radiation syndrome, which are also known as deterministic effects. These are effects which are certain to happen in a short time. The measurement of absorbed dose in tissue is of fundamental importance in radiobiology as it is the measure of the amount of energy the incident radiation is imparting to the target tissue. The absorbed dose is equal to the radiation exposure (ions or C/kg) of the radiation beam multiplied by the ionization energy of the medium to be ionized. For example, the ionization energy of dry air at 20 °C and 101.325 kPa of pressure is 7001339700000000000♠33.97±0.06 J/C. :305 (33.97 eV per ion pair) Therefore, an exposure of 6996258000000000000♠2.58×10−4 C/kg (1 roentgen) would deposit an absorbed dose of 6997876000000000000♠8.76×10−3 J/kg (0.00876 Gy or 0.876 rad) in dry air at those conditions. When the absorbed dose is not uniform, or when it is only applied to a portion of a body or object, an absorbed dose representative of the entire item can be calculated by taking a mass-weighted average of the absorbed doses at each point. Non-uniform absorbed dose is common for soft radiations such as low energy x-rays or beta radiation. Self-shielding means that the absorbed dose will be higher in the tissues facing the source than deeper in the body. The mass average can be important in evaluating the risks of radiotherapy treatments, since they are designed to target very specific volumes in the body, typically a tumour. For example, if 10% of a patient's bone marrow mass is irradiated with 10 Gy of radiation locally, then the absorbed dose in bone marrow overall would be 1 Gy. Bone marrow makes up 4% of the body mass, so the whole-body absorbed dose would be 0.04 Gy. The first figure (10 Gy) is indicative of the local effects on the tumour, while the second and third figure (1 Gy and 0.04 Gy) are better indicators of the overall health effects on the whole organism. Additional dosimetry calculations would have to be performed on these figures to arrive at a meaningful effective dose, which is needed to estimate the risk of cancer or other stochastic effects. When ionizing radiation is used to treat cancer, the doctor will usually prescribe the radiotherapy treatment in units of gray. Medical imaging doses may be described in units of coulomb per kilogram, but when radiopharmaceuticals are used, they will usually be administered in units of becquerel. The Radiology Martyrs monument, erected 1936 at St. Georg hospital in Hamburg, more names added in 1959. In the late 1950s, the CGPM invited the ICRU to join other scientific bodies to work on the development of the International System of Units, or SI. It was decided to define the SI unit of absorbed radiation as energy deposited per unit mass which is how the rad had been defined, but in MKS units it would be J/kg. This was confirmed in 1975 by the 15th CGPM, and the unit was named the "gray" in honour of Louis Harold Gray, who had died in 1965. The gray was equal to 100 rad, the cgs unit. Absorbed dose is also used to manage the irradiation and measure the effects of ionising radiation on inanimate matter in a number of fields. Absorbed dose is used to rate the survivability of devices such as electronic components in ionizing radiation environments. The measurement of absorbed dose absorbed by inanimate matter is vital in the process of radiation hardening which improves the resistance of electronic devices to radiation effects. Absorbed dose is the physical dose quantity used to ensure irradiated food has received the correct dose to ensure effectiveness. Variable doses are used depending on the application and can be as high as 70 kGy. ^ Podgorsak, E. B., ed. (2005). Radiation Oncology Physics: A Handbook for Teachers and Students (PDF). Vienna: International Atomic Energy Agency. ISBN 92-0-107304-6. Retrieved 25 November 2012. ^ ICRP 2007, p. 1. ICRP (2007). "The 2007 Recommendations of the International Commission on Radiological Protection". Annals of the ICRP. ICRP publication 103. 37 (2–4). ISBN 978-0-7020-3048-2. Retrieved 17 May 2012. Specific Gamma-Ray Dose Constants for Nuclides Important to Dosimetry and Radiological Assessment, Laurie M. Unger and D. K . Trubey, Oak Ridge National Laboratory, May 1982 - contains gamma-ray dose constants (in tissue) for approximately 500 radionuclides.